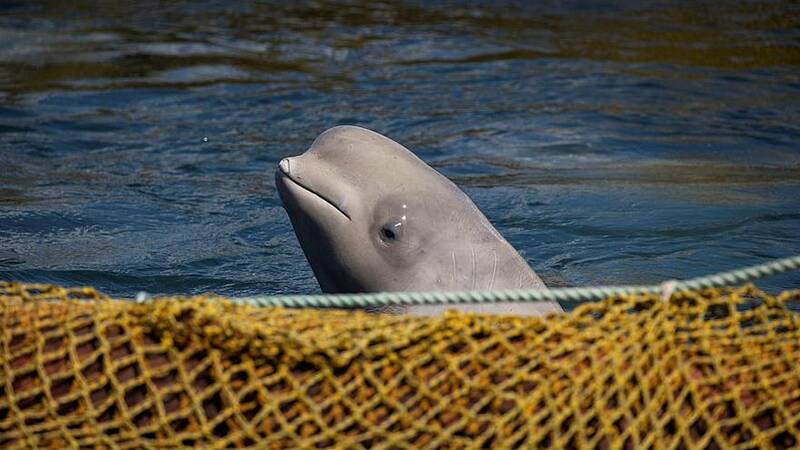 After months of international outcry, the so-called "Russian whale jail" is set to close. On Sunday, authorities signed an agreement with a group of international scientists to free nearly 100 whales that have been held for months in cramped pens in the country's Far East. The move coincides with a highly publicised visit by a team of scientists led by Jean-Michel Cousteau, son of French marine expert Jacques Cousteau. Images of the 10 orcas and 87 beluga whales first appeared after they were caught last summer by firms which planned to sell them to marine parks or aquariums in China. Their release is likely to be phased. "A decision in principle has been taken to release all the animals into the wild," Oleg Kozhemyako, the governor of Primorsky Region, told reporters after the signing ceremony. "Scientists, including both Russian and international scientists from the Cousteau Team, will continue to evaluate the animals to determine when and how to release them," according to a joint statement by Russian authorities and scientific organisations. "We also expect that a rehabilitation centre will be created for those animals that are injured in wild nature and that need to be rehabilitated," the statement said.